by Robert Buchanan (adapted from the novel, Le Maître de Forges by Georges Ohnet). London: Globe Theatre. 11 April to 29 June, 1883. New York: Wallack’s Theatre. 13 February to 12 April, 1884. Bristol: New Royal Theatre. 3 September, 1883. (First date of provincial tour). London: Pavilion Theatre. 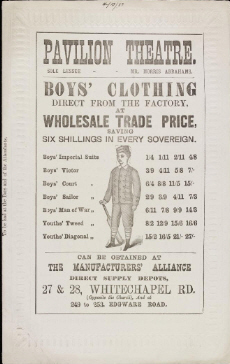 1 October, 1883. New York: Niblo’s Garden. 5 January, 1885. (Featuring Harriett Jay). London: Pavilion Theatre. 24 August, 1885. (Featuring Harriett Jay). Buchanan had adapted Ohnet’s novel without permission which, following the appearance of Ohnet’s own theatrical adaptation, led to an exchange of letters in The Era in December, 1883. Arthur Wing Pinero’s authorised adaptation of Georges Ohnet’s play, Le Maître de Forges, with the title The Ironmaster, opened on 17th April, 1884 at the St. James’s Theatre, starring Mr. and Mrs. Kendal. For purposes of comparison I’ve placed several reviews of The Ironmaster on a separate page. Mr. Robert Buchanan, of the fleshly school fame, is going once more to try his hand at a play, or rather at two plays, for next month he will hold possession of two theatres, the Adelphi and the Globe. One of these will be described as a melodrama, and the other as an historical play. Mr. Buchanan is in bad odour with the critics, and whatever may be said for his poetry, there is certainly no very strong disposition on the part of the public to patronise his plays. He is undeterred by past failures, and if there is anything in the virtue of perseverance or the magic of patience, Mr. Buchanan’s approaching dramas ought to be of a different character to his last production. A NEW “comedy drama of society,” in five acts, written by Mr Robert Buchanan, is in rehearsal at the Globe Theatre, where it will be produced at the end of the run of Jane Eyre. Mr Robert Buchanan’s new comedy in five acts is in rehearsal at the Globe, where it will probably be produced on or about February 10. Mrs Bernard Beere will undertake the chief part. Mrs. Bernard Beere is about to abandon the Globe Theatre, and, though the reasons given are that her health has suffered, I believe I am not breaking confidence when I say that it is for a more potential reason. It is no secret that Mrs. Beere’s losses since she has taken the theatre have been very large. She has had to stem the tide of one continued run of ill-luck, and it is no discredit to her that she should be indisposed to make further demands upon the resources of her friends. The consequence of Mrs. Beere’s departure will be that Mt. Robert Buchanan’s new play will not be produced at this house, but probably at the Opera Comique, for which Mr. Buchanan is negociating on his own account. Referring to a paragraph which appeared in this column on the 2nd ult., to the effect that the play by Mr. Robert Buchanan, which was to have taken the place of “Jane Eyre” at the Globe Theatre, was not very favourably spoken of by those who had seen the rehearsals, Mr. Buchanan informs us that the play in question has never been cast or rehearsed. The facts are, he says, that the play had been accepted by Mrs. Bernard Beere, and it was arranged that it should succeed “Jane Eyre,” but immediately after its acceptance the manuscript was returned to the author for some trifling corrections. We regret that our correspondent was misinformed, and take the earliest opportunity of placing our readers in possession of the facts of the case. 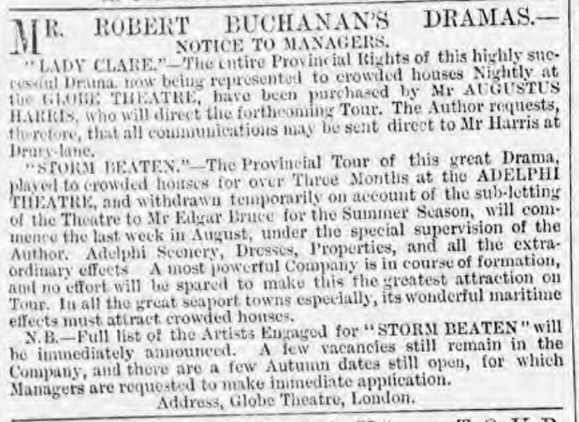 The play in question was, it may be added, to have been produced at the Globe Theatre, from the management of which Mrs. Bernard Beere has, owing to illness, been obliged to retire, and must not be confounded with Mr. Buchanan’s new drama, “Storm-Beaten,” which was produced on Wednesday last at the Adelphi, and appears to have been very favourably received. Mr Robert Buchanan has taken the Globe Theatre, with the view of producing a new play which he has written, but which has not yet been named. The right of performing “Storm Beaten” in America, which Mr Buchanan sold for £600, has just been resold for £2000—the increased value being due to the favour with which the play has been received in London. MISS ADA CAVENDISH will appear at the Globe Theatre as Lady Clare, in Mr Robert Buchanan’s new society drama of that name, now in active rehearsal. Other characters in the play will be intrusted to Miss Harriett Jay, Miss Lydia Cowell, Miss Carlotta Leclercq, Mr Alfred Bucklaw, Mr Philip Beck, and Mr Horace Wigan. Lady Clare is in five acts, and, although the characters are modern, the subject is one of romantic interest. Mr. Robert Buchanan has taken over the remainder of Mrs. Bernard Beere’s lease of the Globe Theatre, and will produce there on Saturday, a new one-act poetical comedy, entitled “A Dark Night’s Bridal,” and a five-act modern drama, “Lady Clare,” both pieces being from his own pen. The heroine in the latter will be played by Miss Ada Cavendish, and among the other members of the company may be named Miss Harriet Jay, Miss Lydia Cowell, Miss Carlotta Leclercq, and Mr Philip Beck. The Globe Theatre, which has been taken for a month for the performance of Mr. Robert Buchanan’s new play, “Lady Clare,” is undergoing structural alterations which have necessitated the postponement of the “first night” till Wednesday next. It is understood that Mr. Robert Buchanan in this piece employs a personage who has been popular in comedy since the days of “New Men and Old Acres,” to wit, a wealthy parvenu whose alliance is sought by an aristocratic family. The marriage takes place, Lady Clare being the bride, and the rehabilitation of the vulgar hero, which seems to be an essential of such pieces, is effected by means of a duel between him and an aristocratic rival, which constitutes the leading situation, and in which the lady, in throwing herself between the combatants, is accidentally wounded. Lady Clare will be played by Miss Ada Cavendish, but the cast in other respects is not strong. GLOBE THEATRE.—This theatre reopened last night, with a “new drama of modern society,” entitled Lady Clare. The author is Mr. Robert Buchanan, who acknowledges his indebtedness to a French romance for the basis of the plot. There is very little material in the play, however, which has not done duty on the stage before now; but, on the whole, the interest, which is of a serious nature, is well sustained. Merely chronicling the favourable reception awarded the piece, in which Miss Ada Cavendish, Miss Harriet Jay, and Miss Lydia Cowell appeared with considerable effect, we reserve details until a more convenient opportunity. The author and actors were called before the curtain at the conclusion. The adaptation from the French by Mr. Robert Buchanan, produced at this theatre last night under the title of “Lady Clare,” has the merit of a definite and prevailing idea. In the first bitterness of her resentment a girl, thrown over by the man she loves, who has all but proposed marriage to her, accepts the offer of a suitor whom she despises and whom she had previously rejected. A hasty marriage ensues, and the bride, on being conducted to her new home, shows such extreme repugnance to her husband that, with mingled grief and anger, he consents to their marriage being merely nominal, stipulating, however, that she shall remain under his roof and bring no reproach upon his name. In the course of time the manly firmness and dignified sorrow of the husband gradually sap the aversion of the wife, who, from tolerating, comes in secret to love him. At this juncture the first lover reappears and insults with dishonourable proposals the woman he had already slighted. His conduct becomes known to the husband, and a duel between the two men is the result. As the duel is about to commence the wife, Lady Clare, rushes in to prevent it, interposes between the combatants and is wounded by the would-be seducer. She has really come to prevent if possible the duel for her husband’s sake, but he is still ignorant of her love for him and ascribed her intervention to her affection for his worthless adversary. The latter shares this conviction, and therefore, upon the lady’s recovery from her wound, seeks her to thank her for her devotion and to renew his affronting suit. She then informs him that she has learned to despise him and to loath his dishonouring advances; moreover, that her husband has won her heart and that it was solely on his account she interfered in the duel. As the husband overhears these passages it will easily be surmised that a reconciliation is effected and a happy ending attained. According to theatrical conventions the vicious manly lover of the piece is, of course, an aristocrat, while the husband is a member of the bourgeoisie. It would perhaps have been a refreshing novelty to have shown for once the possibility of these class features being reversed. However this may be, there is undoubtedly a dramatic notion at the root of this brief story. The success of a piece, however, depends not only upon its idea, but upon the way of working it out. There is certainly a want of verisimilitude in the conduct of Lady Clare, the heroine, when she enters the dwelling of John Middleton, her husband. Her protestations to him, her entreaties that he will not touch her, and her efforts to escape from the house, introduce a dangerous approach to the comical into a serious crisis. Lady Clare, in the course of the three or four days which must have elapsed before her marriage, had abundant opportunity for reflection and for understanding that it would be too late to withdraw from the obligations of her union after it had taken place. It might have been better for the husband to have divined her revulsion from him by her silent depression, to have extorted from her an avowal of her dislike, and then voluntarily to have proposed their all but nominal separation. Those good qualities of Middleton, moreover, which we are told ultimately conquer Lady Clare’s love, might with advantage have been more frequently exhibited in action. The scenes in which Middleton and the dissolute Lord Ambermere quarrel and prepare to fight have so far a familiar enough flavour, but a zest of novel effect is doubtless provided when the wife, interposing between the duellists receives the ball intended for her husband. The dialogue of the piece is natural, to the point, and spirited whenever spirit is required. Its main weight devolved upon Miss Ada Cavendish, who rendered the various nuances of the heroine’s character with great skill, and its crises with such intensity as to call forth the loudest demonstrations. As a genial lad, ambitious of the dignity of manhood, Miss Harriett Jay acted with such spontaneousness, and with such a genuine sense of humour as to afford most valuable relief to the serious interest of the drama. John Middleton, the noble-minded husband, was delineated with taste and judgment by Mr. Alfred Bucklaw, though for the full realisation of his part more firmness of outline and more suggestive detail of manner are requisite. Mr. Horace Wigan and Mrs. Digby Willoughby played respectively with good effect the characters of the American millionnaire and his daughter, the latter of whom becomes the wife of Lord Ambermere. That undelightful nobleman was well personated by Mr. William Beck. It cannot be said that Miss Carlotta Leclercq found much scope for her recognised ability in the part of the fastidious Lady Broadmeads. Miss Lydia Cowell filled satisfactorily the part of Middleton’s sister, who eventually pairs off with the lively Cecil Brookfield. The scenery was all that could be desired, the scene of Act I being especially charming. The recalls during the piece were frequent, and the applause at its close was loud and unanimous. The author and the chief actors were warmly summoned. If success be determined by full and generous applause at the close of each of the acts of a five-act drama, by welcomes of a favourite actress to the footlights, and by the conventional call for the author, then should Mr. Robert Buchanan be satisfied with the reception given to “Lady Clare” last night. And yet there were times in the course of the evening when listless attention, wandering eyes, and dissatisfied glances told of a story strong in itself, capable of character, and with sufficient human interest, yet feebly and insufficiently grasped by the dramatist. Luckily the acts were short, and the action, such as it was, unstrained and rapid. Luckily also the curtain fell upon situations that were accepted as striking, and so the brevity of the drama saved it from the impatience that has settled the fate of plays of stronger substance and written in a less commonplace style. The London playgoer with a faithful memory might have been reminded of the strong scenes of many favourite plays as act succeeded act and scene followed scene. Now it was the “New Men and Old Acres” of Mr. Tom Taylor and Mr. A. W. Dubourg; now the “Lady of Lyons” of Bulwer Lytton; now the “Old Love and the New” of Mr. Bronson Howard; now the “Impulse” of Mr. B. C. Stephenson. There are recollections, no doubt, of all these plays, and yet no charge of plagiarism can be laid at the door of Mr. Robert Buchanan, who has candidly owned that his play is “founded on a celebrated French romance.” He might have added that the romance in question is called “Le Maitre de Forges,” by Georges Ohnet; that it appeared originally in the feuilleton of the Paris Figaro; and that the author of “Serge Panine” has already dramatised it for the French stage. If Parisian gossip is to be credited, the new play has been accepted at a popular theatre, and the character of the self-denying ironmaster will be taken by Marais, the young actor who so distinguished himself in the “Danicheffs.” How M. Georges Ohnet’s romance will turn out when the author dramatises it for Paris it is impossible to say, but at the outset the given material seemed capable of better things than are awarded us in “Lady Clare.” In his natural nervousness to avoid the pitfall of prolixity, in his anxiety to tell the tale shortly and concisely, and fearing, no doubt, to weary his audience with psychology, Mr. Buchanan has weakened the interest that might be otherwise felt in his leading characters. A woman who marries a thoroughly good man out of pique, who begins by detesting his presence and his conversation, who treats him with insolence and disdain, and is eventually won over to admiration of his manliness, his truth, and his trust, is no new figure in romance; and yet her life and her sorrows are capable of great dramatic expression. The allusion—the pointed allusion—to Queen Guinevere and King Arthur in such a case is a little strained, and yet there are Guineveres and King Arthurs in the real world of to-day whose lives, if properly told, would make very excellent dramas. Mr. Buchanan has only succeeded in sketching for us a weak Lady Clare and a shadowy John Middleton. The characters are faint and invertebrate; they are painted, but in no strong or enduring colours. The Lady Clare Brookfield of Mr. Buchanan’s play is devotedly attached to her cousin, Lord Ambermere, a sulky and boorish specimen of the aristocracy. There is no accounting for woman’s love, even when bestowed upon such a selfish prig as this, a man with not even grace of manner to recommend him, and there is but little sympathy with Lady Clare’s distress when she learns that this gambler and spendthrift has jilted his cousin in order to obtain the fortune of a rich American girl in search of a titled husband. Meanwhile the aristocratic Lady Clare has received an offer of marriage from John Middleton, a wealthy manufacturer, which she receives with bad taste and studied insolence. Directly, however, she discovers she has been jilted by her cousin she calls the manufacturer back, asks his pardon for her rudeness, and consents to become his wife. Such a foolish union could scarcely turn out well, and Lady Clare repents of her rashness on her wedding day. Within a few hours of the marriage she attempts to escape from her husband’s roof, owns her folly and imprudence, and, in a scene that is almost the counterpart of a celebrated situation in the “Lady of Lyons,” the husband swears to respect her unnatural scruples. Man and wife, they are to be strangers from that moment. The echo of the new play “Impulse” is too strong here to be resisted, and the audience feels that the winning of the weak woman by the strong man will be the purpose of the play. It is so, but it is a faint and feeble interest after all. Lord Ambermere, soon sick to death of his designing and extravagant American wife, is vain enough to think that he has only to stretch out his hand in order to gather again the love of his cousin, Lady Clare, but he does not know that her heart is gradually warming towards her cold and determined husband. He does not remember that women like Lady Clare love the strength of a tender man like John Middleton. His conceit blinds him to all. But he follows the ill-assorted couple abroad, he introduces himself upon their society, and he so grossly insults John Middleton that this worthy fellow thinks that because he is at Dieppe he is bound in honour to fight a duel with an insolent prig. It is a curious code for a common-sense Englishman to lean on, but still he consents to go out, feeling not very sorry to sacrifice his miserable life and so free himself from a companionship that is galling to him. Lady Clare is determined to stop the duel at all hazards. Lord Ambermere is an expert duellist, and her husband ignorant of the use of firearms. She will save at least the man who would sacrifice his life for her. The meeting is fixed in a lonely wood, the distance is measured, the men retire, the signal is given, and at the report Lady Clare falls, apparently dead, between the astonished duellists. She has rushed between them and received in her shoulder the contents of her cousin’s murderous pistol. The situation is no doubt effective. It was strengthened by the admirable art and very clever stage fall of Miss Ada Cavendish; but a little more art and method in the stage management might have made it stronger still. There is but one more act to follow, and it is devoted to the reconciliation between husband and wife. Long foreseen and foretold. Lord Ambermere makes another impudent attempt to win his cousin from her allegiance, but she denounces him as a coward and honest John Middleton threatens to kick him out of the house—a statement received with enthusiasm by the audience, weary of the obtrusive villany of a character most necessary for contrast, but sketched with very little skill. Lord Ambermere should at least have been a possible lover for such a woman as Lady Clare, but it was the fault of the author and not of Mr. Philip Beck that he had no redeeming quality and was consistently detestable. The acting merit of the play was certainly not great; it must have been uphill work with all the artists engaged in it, and most of all for Miss Ada Cavendish, who tried most bravely to make a character out of a sketch. Whenever the author gave her an opportunity she availed herself of it, and she played equally with taste and courage. There was fire in her denunciation of her shameless lover, and not a little tenderness in the short scene of reconciliation with the husband in the last act. Never, however, did an apparently strong part give less chance to the actress. What could be done with it Miss Cavendish certainly did, but it was a trying task for an actress of so much nerve and impetuosity to be always working up to a point that the structure of the play would not allow to come. Mr. Alfred Bucklaw, an actor new to the London stage, was entrusted with the very important character of John Middleton. he began nervously and indistinctly, but warmed with his work, and at last played the part with presence and good taste. Mr. Horace Wigan—execrably made up as an American millionaire—and Miss Carlotta Leclercq had little chance in shadowy characters of very minor importance; and Miss Digby Willoughby could do little in the way of effect with such a thin part as that of the American adventuress. The lightest and most refreshing waves of relief to the play were given by Miss Harriet Jay and Miss Lydia Cowell as a boy and girl lover. Ladies seldom play boys’ characters quite naturally, but Miss Jay proved an exception to the rule. She was full of spirits but never vulgar: not quite an Eton boy perhaps, but still a pretty and quick-spirited lad who found his way to the goodwill of the audience. The scenery, by Mr. Perkins, was as charming as it ever is. Taken as a whole the play is so injudiciously cast—particularly in regard to the male characters—that it would be rash to predict the same good-natured enthusiasm on another occasion. The practised eye can see in M. Georges Ohnet’s romance the material for a very effective play, but, in “Lady Clare,” Mr. Robert Buchanan has only given us the faint outline of a substantial drama. Not an emotion is touched by the recital of the sorrows of Lady Clare or the beauty of her husband’s character. The pulse never beats quicker as the play proceeds. It has promise and a certain theatrical effect; but it is shallow, and has no heart in it. LONDON, Wednesday night.—A new five-act drama by Mr Robert Buchanan was produced for the first time at the Globe Theatre this evening. The piece which is entitled “Lady Clare,” is acknowledged in the programme to be founded on a French romance; but Mr Buchanan might have gone further, for the drama runs so substantially on the lines of Adolphe Belot’s “Le Maistre de Forges” that the adapter can claim but little originality for it. At the same time it must be conceded that Mr Buchanan has very successfully Anglicised his French original, while the last act is, as far as our memory serves us, substantially his own. The plot concerns itself with the fortunes of John Middleton, a wealthy manufacturer, who marries a haughty beauty, Lady Clare Brookfield, the lady being in love with her cousin, Lord Ambermere. Though they are married, Lady Clare denies her husband all marital rights, and they agree to live apart. They go abroad, and she is followed by Lord Ambermere, who has himself married an American heiress, the result being that Middleton and his Lordship fight a duel, which is interrupted by the former’s wife, who falls apparently dead. In the end, however, she recovers, and though her lover pursues her, her heart turns at last to her husband, and all ends in the orthodox fashion. Lady Clare is a well-written and interesting play, though the earlier scenes would be much improved by compression, and it will certainly add to Mr Buchanan’s reputation as a dramatist. If it failed to make its mark to-night, it was owing to the weakness of the representatives of the chief male characters. Mr Bucklaw as Middleton and Mr Beck as Lord Ambermere were overweighted with what the author had given them to do, and scenes which would have created a great impression failed to touch the audience by reason of the histrionic shortcomings of these gentlemen. In the ladies who acted for him Mr Buchanan was more fortunate. Miss Ada Cavendish, although she has not got rid of a certain hardness of manner, played with skill and welcome intelligence as the heroine, Lady Clare; and Miss Lydia Cowell played very cleverly and naturally as Mary Middleton. Miss Carlotta Leclerq’s experience was of much value in a minor part, and Miss Harriet Jay played a lad with infinite truth and many pleasant touches of humour. This lady has, indeed, rarely been seen in a part which showed her to so much advantage. Mrs Digby Willoughby and Mr Horace Wigan must also be commended, the former being much applauded. A word must be said for the music played during the piece, which was of exceptional merit, the orchestra being conducted by that popular young composer, Mr Walter Slaughter. “Lady Clare” was warmly received by a large and attentive audience, and at the conclusion the author and the principal actors and actresses were called before the curtain amid loud applause. With due curtailment, the drama should have a successful career before it. Mr Robert Buchanan’s new drama of modern society, entitled “Lady Claire,” was produced at the Globe Theatre last night, under the author’s personal direction. On the playbill Mr Buchanan acknowledges that the piece is founded upon a celebrated French romance, the work in question being apparently M. Belot’s “Le Maitre de Forges,” which was published in serial form in Le Figaro a few years ago. But the story is by no means an unfamiliar one. The Lady Claire is engaged to be married to her cousin, Lord Ambermere, who basely deserts her to wed the wealthy American heiress, Melissa Smale. So the Lady Claire, out of revenge, marries instead the wealthy manufacturer, John Middleton. She does not love him, and on the eve of their marriage she cannot conceal her contempt for him. In a powerful situation, apparently borrowed from “Daniel Rochat,” he agrees to dispense with her affection, while he commands her obedience. But by degrees love grows. Middleton’s worth is so obvious, and Lord Ambermere’s conduct so contemptible, that the Lady Claire begins to adore her husband as much as she previously hated him. Matters are brought to a climax when the two men meet to fight a duel. The Lady Claire throws herself between them, and is accidentally shot and wounded by the villain. In the last act Lord Ambermere again appears. His wife has eloped, and he comes ingenuously to beg the Lady Claire to flee with him, but in a strong scene, most powerfully acted by Miss Ada Cavendish and Mr Beck, she tells him the truth. Her husband overhears the avowal of her affection, and clasps her in his arms as the villain is ignominiously ejected. A pretty little underplot is carried on between a young scion of the nobility (a part played by Miss Harriett Jay) and little Mary Middleton, a rôle in which the special talents of Miss Lydia Cowell were again amply demonstrated. Miss Cowell is usually at her best in character parts, but as Mary Middleton she gives an almost idyllic portraiture of fresh and girlish innocence. The play contains many crudities which a revision will remedy, and it was unfortunate in a feeble representative of the part of the husband. But “Lady Claire” was on the whole received with undoubted favour, and the author, on his appearance at the final fall of the curtain, was warmly cheered. It is not to the pages of a French novelist that one would readily turn for trustworthy sketches of “society” as it is known in England. Such, however, would seem to be the source, though the extent to which it has been drawn upon is not very candidly avowed, of both the types of character and the motives animating them in Mr. Robert Buchanan’s new drama of “modern (and presumably English) society” presented at this theatre. It must unhesitatingly be stated that Lady Clare is not what it professes to be—a reflex of English society at the present day. It is a reflex, if anything at all, of the disordered fancy of a Parisian feuilletoniste. The people to whom it introduces us are English indeed by name, but otherwise unrecognizable as such, and the author is certainly a little too sanguine in assuming that they are to be taken at his word as representative English types, or that the sickly sentimentality inherent to such a set of characters is to be carried off by a Tennysonian quotation in the playbill. The kernel of the story of Lady Clare is a loveless marriage between a high-born lady and a wealthy manufacturer, into which a certain amount of dramatic interest is imported by the presence of an unscrupulous tempter of female virtue of the lady’s own rank. It is easy to see how such a subject, which will be recognized as that of M. Georges Ohnet’s novel Le Maître de Forges, must be treated. The reconciliation of man and wife is a foregone conclusion, and the wearisome process of bringing about this result must be relieved by such exciting incidents as the author can contrive. That a play constructed upon such lines should fail to awaken the sympathy of the audience is almost a matter of course. The faults of Lady Clare arising from this cause need not, therefore, be insisted upon. There is the less occasion for surprise at the weakness of the play from the fact that the incidents upon which the author relies for dramatic effect have been largely borrowed from such familiar and incongruous sources as The Lady of Lyons, Octave Feuillet’s Tentation, and Victor Hugo’s Marion de Lorme; what is surprising, indeed, is that a sense of the ridiculous should not have deterred Mr. Robert Buchanan from attempting to adjust such romantic material to the conditions of English society at the present day. It is not easy to repress a smile when Lord Lytton’s romantic cottage scene is reproduced in a modern drawing-room. But admitting the possibility of a Manchester cotton-spinner entertaining the same delicate scruples with regard to the modesty of his bride as Claude Melnotte displayed towards Pauline, what are we to say when, at a subsequent period, the author resorts to the grotesque expedient of transporting the whole of his characters bodily to French soil—namely, to the Casino at Dieppe—to allow of the duel being fought which constitutes the turning point of the story? No one need quarrel with Mr. Robert Buchanan for confessing himself unable to adapt the duel into anything English, fisticuffs or horse-whipping being impracticable, owing to the heroine being required to throw herself between the combatants and receive in her shoulder a shot intended for her husband’s heart. But it is not clear why a story so essentially French should have been decked out in English garb at all. Apart from its incongruity in an English play, however, the duel scene, it must be confessed, is a powerful one, and will doubtless contribute largely to what success the play may achieve. The hostile meeting arranged between her husband and her aristocratic persecutor no sooner comes to Lady Clare’s knowledge than she resolves to prevent it, for in the course of the play her indifference to the wealthy manufacturer is supposed to give place to a warmer feeling. But the parties reach the spot; the preliminaries are arranged; the pistols taken out of their cases and examined. Then the combatants are placed back to back; the signal is given; they measure their paces, turn round to face each other, and it is as they are in the very act of firing that the lady interposes her body as a shield to her husband, thus adding to the impressiveness of the duel in La Tentation a touch of the womanly devotion of Marion de Lorme. The period of the heroine’s convalescence in the last act brings with it naturally enough her reconciliation with her husband. Long foreseen, this produces, however, little satisfaction to a wearied audience. What is more to the point, as being the only genuine bit of English character in the play, is that the husband threatens to kick his wife’s persecutor downstairs on his again turning up to renew his detestable suit. Miss Ada Cavendish, as Lady Clare, does much to redeem the play by her refined and graceful acting and by her perfect command of “business” down to her sensational fall in the duel scene. But sympathy is beyond her reach. The character, as it has been shaped by the author, is too inconsequent and too superficial to move, or even to interest, deeply. Insolence and vacillation, both of which Lady Clare displays freely, are hopelessly inconsistent with the tenderness essential to a sentimental heroine. Mr. Bucklaw plays the husband with as much manliness and dignity as is compatible with the air of ridicule unwittingly thrown over this character by its author. As a disreputable member of the aristocracy Mr. Beck is wanting in persuasiveness, but he invests the character with some outward distinction. 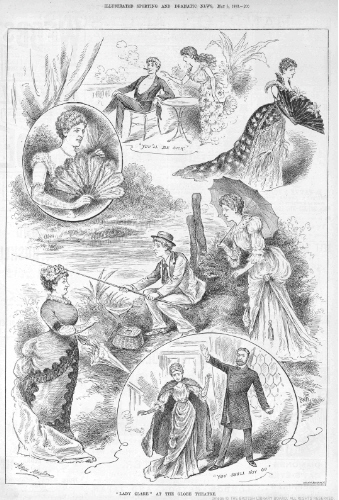 The lighter business of the play is refreshingly supplied by Miss Lydia Cowell and Miss Harriett Jay, at the cost of the latter lady being allowed to masquerade in boy’s clothing, and a picturesque but unpleasant element is introduced by Mr. Horace Wigan and Mrs. Digby Willoughby as an American millionaire and his daughter—”Yanks” of an ultra-vulgar type. MR. ROBERT BUCHANAN’S new drama, “Lady Clare,” with which the Globe Theatre has reopened, is a creditable piece of dramatic workmanship. No claim to originality is put forward by the author, who owns that the story is founded upon “a celebrated French romance.” Apart from any question of indebtedness to foreign sources, “Lady Clare” contains so much that is common to different works of English origin it might, but for an informing breath of passion which animates the whole, fusing—so to speak, the miscellaneous ingredients into homogeneity—be regarded as a species of mosaic. At its opening the plot suggests Tom Taylor’s “Still Waters Run Deep,” in its progress it recalls “The Lady of Lyons,” the great effect of the fourth act runs parallel with a scene in “The Old Love and the New,” and the closing situation is all but identical with that of “Impulse.” As much originality, however, as is to be hoped in days when the subjects by which an English public can be stimulated are shapen and reshapen, turned inside out and wrong side up, may be conceded to “Lady Clare,” which for the rest has shapeliness, effective characterization, and strong dramatic interest. The story is that of a woman, who, marrying one man while loving another, is won over by her husband’s unflinching fortitude and unexacting tenderness to the knowledge that what she regarded as a blank in the matrimonial lottery is in fact the highest prize. So cruel and heartless has been her conduct and so open her avowal of love for another, she cannot find courage to make to her husband the confession of love for which he pines. The two men, husband and lover, whom she has set at feud meet abroad. A duel, in which the chances are all on one side, is fought. At the moment when with deadliest purpose the pistol of a professed duellist is directed against the breast of a man who has never drawn a trigger, the heroine, to whom the place of meeting has become known, rushes forward and receives in her own breast the bullet intended for her husband. This instance of supreme devotion fails to touch the hero, who arrives at the natural conclusion that the life she sought to shield was that of his opponent. Another meeting between the wife after she has recovered from the effects of her wound and the man she has learned to despise and hate is accordingly brought about. The conversation which ensues is overheard by the husband, who listens to a declaration from his wife’s lips of such love for him and pride in him as brings about an instantaneous and a rapturous reconciliation. Not very much is there, perhaps, in this idea. So happily worked out are the details, and so brisk is the action, there is no moment at which the story falters or the attention of the audience flags. In each of the five acts which the piece contains a dramatic situation is reached. That in the penultimate act is strengthened by an element of surprise which, however dangerous when it is injudiciously employed, exercises at times, as in the present instance, a marvellous effect. The whole obtained accordingly a warm reception, and the call for Mr. Buchanan at the fall of the curtain was enthusiastic. “Lady Clare” is adequately mounted. The acting is stronger in the female characters than in the masculine. Miss Ada Cavendish as the heroine obtained a signal triumph. Her acting had marked spontaneity and variety, and contributed greatly to the success of the play. Miss Harriett Jay as a youth played with success more emphatic and unchallenged than she has hitherto known. Miss Lydia Cowell. Miss Carlotta Leclercq, and Mrs. Digby Willoughby were at ease in the rôles assigned them. Of the men Mr. Bucklaw, who played the husband, alone made any noteworthy display of power. Mr. Philip Beck did little with the part of an aristocratic villain, and Mr. Horace Wigan;s small rôle of a comic American was so absurdly travestied that the service he might have rendered to the performance was neutralized. Mr. Robert Buchanan’s persistent attempts to win a leading position as a dramatist will probably some day be crowned with success, for in each new play from his pen the fruits of the experience he has acquired of stage work are more and more apparent. “Lady Clare,” performed last night at the Globe Theatre, would have been given under Mrs. Bernard Beere’s management had she not suddenly given up the direction of this house. It is a drama possessing many good and striking qualities. The author acknowledges indebtedness for his story to “a celebrated French romance,” no doubt meaning “Le Maitre de Forges” by M. G. Ohnet, but the piece really owes its chief situations rather to “The Lady of Lyons,” “The old Love and the New,” “Impulse,” “Led Astray,” and several other well-known plays. Miss Ada Cavendish acts very finely as the Lady Clare, united to a man she has married in a fit of pique when jilted by her cousin, a heartless and dissolute young lord. The performance was, indeed, rendered remarkable by the great dramatic power she displayed, her graceful diction, and refinement of bearing. Miss Cavendish gave thrilling effect to the most exciting and novel incident in the piece, when, to prevent a duel between her husband and her former lover, Lady Clare rushes between the combatants and receives the bullet that would have struck her husband. Miss Lydia Cowell played an ingenue part most charmingly, and in some very sprightly love scenes with her boyish admirer (cleverly interpreted by Miss Harriett Jay) did much to enliven the action. Lady Clare, the new play written by Mr. Robert Buchanan and produced at the Globe Theatre on Wednesday evening, is a charming story ineffectively treated. It is very ill-constructed and not too much pains has been bestowed upon the dialogue. Lest some of our readers may detect a resemblance between this play and certain scenes in well- known dramas, it may be as well to state that its origin, although not acknowledged by Mr. Buchanan, who simply announces that he has founded his piece upon a French romance, is the novel entitled “Le Maitre de Forges,” written by M. Adolphe Belôt, which appeared in the pages of the Paris Figaro. The story is really pretty, but the palpable want of constructive power on the part of the adaptor must be evident even to those who are not well-versed in stage matters. The first of the five acts into which the play is divided takes place at the house of Lady Clare Brookfield. Lady Clare is in love with Lord Ambermere, and her affection is returned. She is also loved by a wealthy manufacturer, John Middleton, who asks her to be his wife. She refuses his suit, but on hearing that Lord Ambermere is ruined, and that, in order to retrieve his fortunes, he is about to marry a rich American girl, and also to recoup her own shattered fortune, Lady Clare agrees to marry Mr. Middleton. In the second act we hear that the heroine is married, but still, not loving her husband, she resolves to fly from him. Middleton will not allow her to thus desert him, and he and his wife determine to live together husband and wife in name only. The third act takes place at Dieppe. Lord Ambermere has followed thither Lady Clare, and, through an opportunity provided by his wife, who is jealous of his old love, he makes an avowal of his passion for her. He is interrupted by the arrival of Middleton, and the two men quarrel. A duel is therefore arranged. The fourth act shows in its first scene how Lady Clare discovers that her husband is going to fight Lord Ambermere. The second scene of this act takes place in a forest glade. The two men arrive to fight, and just as they fire—the duel being with pistols—Lady Clare rushes on and falls apparently lifeless. The last act depicts the recovery of Lady Clare, who has only been shot in the shoulder by the bullet intended for her husband. At last she has learnt to love her husband, and she recognises the value of his noble nature. She is debating in her mind as to the expediency of telling him that she loves him, when the intrepid, shameless Lord Ambermere enters and again protests his love. He is vain enough to think that in her endeavour to stop the duel Lady Clare had been concerned in his safety instead of that of her husband. But for once he is mistaken, and the lady turns upon him and tells him that she loves her husband. Middleton has heard her repulse the scoundrel, and he orders Lord Ambermere off the premises. The villain slinks off, and at length husband and wife are united. It must be confessed that there is some poetry in such a story as this, but Mr. Buchanan’s play cannot succeed. It is too weak and undramatic, and he is much at fault in his female characters. he has made his heroine unnecessarily guilty, and he has provided her with a singularly mercenary mother—a character played with her accustomed art by Miss Carlotta Leclercq. Then in the American girl he has shown a very heartless, jealous type of woman. These characters, or rather similar ones, are no doubt common enough in the world, but they are not the most edifying pictures of woman. Lady Clare is pourtrayed with admirable finish and artistic feeling by Miss Ada Cavendish, but the actress has very little chance for the display of her well-known ability. Her talents have very little scope, but all the same Miss Cavendish throws all her resources into the part and acts it with all the success that can possibly be extracted from it. Her delivery of the one strong speech in the play—that in the last act, where Lady Clare renounces her lover—was marked on Wednesday night by all her fire and passion. John Middleton is played by Mr. Alfred Bucklaw, who is earnest, but not strong enough for the character. Mr. Philip beck has improved somewhat in his style as Lord Ambermere, but he has yet to learn how to move with ease, and to be less stilted in his acting. Mr. Horace Wigan plays the small part of a Yankee millionaire. Mr. Wigan distinguishes himself by the most extraordinary make-up that has ever been presented in a serious manner, and by a tendency to keep all his speeches to himself. Indeed, most of the actors at the Globe seem to labour under the disadvantage of having no voices, for it was only with the greatest difficulty that some of them could be heard. Miss Harriett Jay appears as a schoolboy, and gives a very pleasing presentation. Miss Lydia Cowell is also bright and vivacious as an ingenuous girl. Mrs. Digby Willoughby plays the American girl and is successful, but she may be asked for the sake of decorum to remedy the rather startling evening dress which she wears in the third act. The other characters are not remarkably well acted. The scenery, most of which is old, serves the purpose. The title of Mr Buchanan’s new play, produced at the Globe Theatre on Wednesday evening, and the quotation from Tennyson’s “Idylls of the King,” may have led to the supposition that Lady Clare owed more to the Poet Laureate than it really does. Beyond a few lines introduced at the close, which could be omitted without any detriment to the piece, there is little to recall Mr Tennyson’s poem, and the “celebrated romance” referred to by Mr Buchanan is evidently “Le Maitre de Forge,” by M. Georges Ohnet, author of the novel and play Serge Panine. The romance appeared as a story in the Paris Figaro, but this only supplies the leading outline of Lady Clare, which professes to be a play of modern life and society. Mr Buchanan has been indebted to other pieces for hints and suggestions, which he has made use of to build up a play of a popular and attractive kind, likely to enjoy a considerable run. The piece opens in the grounds of the Countess of Broadmeads, whose daughter, Lady Clare, makes no secret of her attachment to her cousin, Lord Ambermere. She is represented as excessively proud of her social position, yet as having a generous and passionate nature. Her beauty and grace have attracted a wealthy manufacturer, John Middleton, who, although aware beforehand that he will be rejected with disdain, cannot resist his infatuation, and makes the proud beauty an offer. Lady Clare dismisses the manufacturer with freezing disdain, but he has hardly quitted the spot when the family solicitor arrives, and communicates to Lady Broadmeads some very disagreeable intelligence. He informs her ladyship of some serious difficulties of a pecuniary kind, and also startles her with the news that Lord Ambermere, who is believed by Lady Clare to be a perfectly chivalrous and high-minded hero, is simply a ruined gambler, and that his whole career has been one of vice and profligacy; while, in order to get out of his embarrassments, he has become engaged to the daughter of an American millionaire. Lady Clare overhears this with incredulity; but soon all is confirmed, as the American beauty herself appears, and speaks of her engagement. Lady Clare’s resolve is instantly taken. The manufacturer returns, she apologises for her rudeness, and, to the astonishment of all, accepts him, the curtain falling upon this incident amidst hearty applause. The second act is occupied with the first scenes in the married life of the ill-assorted pair. Lady Clare’s pride has kept her from wavering until she actually finds herself in her new home. Then comes the bitter trial, and she fully realises her position. She has not one spark of love, not one bond of sympathy to bind her to this manufacturer, but he is her husband, and appears disposed to claim a husband’s rights. But Lady Clare shrinks with horror from the man she has sworn to love, honour, and obey. John Middleton, deeply moved by her agitation, and still regarding her with the tenderest affection, yields to her entreaties, and Lady Clare retires to her room alone—a situation vividly recalling the famous scene in The Lady of Lyons. After a time, while the husband sits reflecting upon his strange position, he is astonished to see Lady Clare stealing down the stairs. Her object is to escape from the house, and to quit her husband’s roof for ever. But John Middleton’s forbearance stops short at this point. He has consented to be a husband merely in name, but he will not submit to be an object of ridicule and contemptuous pity. With gentleness, but with absolute firmness, he insists upon Lady Clare remaining under his roof. In the third act we find the indulgent husband striving by foreign travel to cheer and console his aristocratic wife, but the baseness of Lord Ambermere becomes every day more apparent. Although married to the millionaire’s daughter, he follows Lady Clare from place to place until at last the patience of the manufacturer is quite exhausted, and the men quarrel and agree to fight a duel at Dieppe. Lady Clare learns the object of this meeting, and, influenced by the dignity and tenderness of her husband as contrasted with the worthlessness of her old lover, makes an earnest effort to avert the catastrophe, but without avail. Driven to despair, she at length resolves to present herself at the spot where the duel is to be fought, but just as she arrives the men are facing each other, and about to fire. Lord Ambermere is a practised duellist, and fires straight at John Middleton’s heart, but Lady Clare, breaking upon them at the critical moment, received the shot in her shoulder. The fourth act ends with this exciting situation, which brought down the curtain amidst vociferous applause. In the fifth act we see Lady Clare once more in her husband’s home. She has at length learned to value the true character of the man she has married, but, fearful of a repulse, she dares not as yet confess that her feelings have changed towards him, and that she now really loves him. But a better understanding is soon brought about, for the contemptible Lord Ambermere again appears, and Lady Clare, although hardly recovered from her wound, is roused to such passionate indignation against him, and utters such tender sentiments of devotion and admiration respecting her husband, that John Middleton, who has heard the concluding sentences, rushes forward to clasp her in his arms, and the reconciliation is complete, the sympathies of the audience being strongly evoked as the curtain falls and the wretched Lord Ambermere is driven from the house by the manly and much-enduring husband. Such are the main outlines of a play not wanting in strong elements of popular attraction, and we believe that, when the inevitable difficulties of a first representation are surmounted, Lady Clare will enjoy a long and prosperous career and prove an acceptable piece with the general public. The strongest claim to this result was unquestionably put forth by Miss Ada Cavendish, who has rarely, if ever, played with greater passion, sentiment, and intensity. She had grasped the character so firmly that we do not see how it was possible to realise it more completely. There were great difficulties for the actress, because there was the risk of the audience regarding Lady Clare as unsympathetic, but it was the greatest proof that could be given of the intelligence and spontaneous force Miss Cavendish possesses that she carried the audience with her from first to last. There was no hesitation, no indecision in her style, and the scene with Lady Clare and John Middleton after the marriage was a most powerful example of the electrical impulse which Miss Cavendish has at her command when she has to represent a really strong situation. In the hands of an inferior artiste this difficult incident might have utterly ruined the piece. But with the striking power Miss Cavendish displayed it became one of the strongest and most exciting scenes of the play. Another very admirable feature must be noted with the greatest commendation. This was the suppressed emotion with which Lady Clare, still influenced by her pride, gradually finds herself drawn nearer and nearer to the man whose very presence at the beginning had so repelled her. There was more than conventional acting in this. There was something like an approach to histrionic genius, and there was a ready impulse on the part of the audience to appreciate the admirable skill displayed. The scene of the duel, although, of course, of a sensational kind, again revealed the quick resource and intelligence of the actress. But even better was the concluding act, when the wife, awakened at last to the rightful claims of the man she has married, and the detestable baseness of her old lover, flashes upon him with words of scorn and contempt, making even his callous nature writhe as every sentence strikes him like a sword. The passionate fury of the insulted lady and the deep sense that she has all along done injustice to the noble nature of her husband were conveyed with splendid power, directness, and passion, while the facial expression harmonised with the sentiments expressed in the most perfect and artistic manner. We must again repeat that Miss Ada Cavendish has not been seen to such advantage for years. Her reputation will gain largely from this striking and impressive rendering of a difficult and exacting character. Her position as an actress never stood higher than when the curtain fell upon the closing scene of Lady Clare. A hint may be given to the author here that an allusion to Tennyson’s poem would answer the purpose perhaps even better than reading the lines. Miss Harriet Jay, we must confess, surprised us in her very clever rendering of Cecil, brother to lady Clare. Miss Jay as the gay, light-hearted boy looked the part perfectly, and played it with animation, intelligence, and buoyancy quite delightful to witness. Her clearly-marked features enabled her to make up well for the character, which pleased the audience immensely. The clever lady had thoroughly caught the spirit of the part. Her manner was light and mercurial, but there were touches of true feeling intermingled in the happiest manner, making the impersonation thoroughly natural, easy, and interesting. It was quite a rarity to see a boy’s part rendered in such a satisfactory manner. Miss Jay has done nothing on any previous occasion so likely as her impersonation of this boy lover to give a good impression of her histrionic skill. We have seldom seen anything of its kind so perfectly attractive, genial, and amusing. Miss Jay had an extremely clever companion in Miss Lydia Cowell as Mary Middleton, the manufacturer’s youthful sister, who falls in love speedily with Cecil. Miss Lydia Cowell was so natural, fresh, and engaging in her style as to make this little character particularly interesting. The boy and girl flirtation carried on between the more serious scenes of the play furnished a lively and pleasant contrast, and in her appearance and manner Miss Cowell supplied not a little attraction to the play. Always bright, cheerful, sparkling, and animated, her presence was not merely welcome, but was looked for with eagerness. Mrs Digby Willoughby has made a considerable advance as an actress of late. She appeared in quite a startling costume—a skirt of flaming crimson and a train of black, covered with gigantic tulips with other floral embellishments, almost making the spectator wink to gaze at them, so dazzling was the effect. Mrs Willoughby’s character was that of the American millionaire’s daughter, and she played it with decided success. The contrast of the fast American, with her blazing costume and pronounced manners, with the quiet refinement of the aristocratic heroine was well kept up throughout, and merited cordial commendation. Miss Carlotta Leclercq was an efficient representative of the Countess; and Miss Clifton Delmar appeared as a housekeeper. Mr Alfred Bucklaw has not had great experience of the metropolitan stage, but he played the character of the manufacturer with much feeling and dignity, and as the play proceeded and his style became more decided his acting was so satisfactory and natural that we may fairly look forward to his taking a good position upon the stage. It may be said to be the first time that Mr Bucklaw has had a chance of distinguishing himself, and he certainly did not disappoint the expectations of his friends. His stage presence is decidedly good, and he gave the right impression of the character from first to last, the latter scenes of the play being excellent. Mr Horace Wigan was but indifferently made up as the American millionaire; and Mr Hamilton Bell did not make much of Count Legrange, and Mr Cannam as the solicitor must not indulge in stage whispers when he relates a story of aristocratic difficulties. Mr Philip Beck as Lord Ambermere had to act all through the play against the sympathies of the audience, but he acquitted himself fairly. Some pleasing scenes added to the attraction of Lady Clare, which was received with great cordiality throughout, the author being called for at the close. We believe there are popular elements in Mr Buchanan’s new play which will secure for it a long run. The action is rapid, the characters varied, and the situations strong, and the author has wisely refrained from overburdening his personages with diffuse dialogue; thus the entire five acts can be played in less than two hours and half, while the interest is well sustained from beginning to end. Although in “Lady Clare,” the new drama of modern society, written by Mr. Robert Buchanan, and produced on Wednesday last, the leading characters may fail to enlist the sympathies of an audience, and although the plot may bring reminiscences now of Bélôt, now of Ohnet, now of Lord Lytton, and now of Bronson Howard, yet there is sufficient interest in the story and the characters are sufficiently strongly drawn to merit the play being stamped as one well worth seeing and deserving more than the stereotyped success usually accorded on a first night to a play that is not absolutely bad. Lady Clare, the heroine, loves her cousin, Lord Ambermere, and although both are poor, yet an engagement exists between them, and is approved of by the Countess of Broadmeads, Lady Clare’s mother, a lady who is by no means blind to the advantages of wealth. Lady Clare has an admirer in John Middleton, a wealthy manufacturer, whom she rejects with—and in all due deference to Mr. Buchanan we think with unnecessary—scorn. Suddenly she learns that her cousin has proposed to an old school-fellow of hers, Melissa Smale, the daughter of an American millionaire, with whom she has always been at heart an enemy. At first she discredits this, but learning from Melissa’s own lips that it is true, she discounts her rival’s triumph by accepting John Middleton’s offer, and introducing him as her affianced husband when the American girl introduces Lord Ambermere as hers. This effective episode terminates the first act. In the second, John Middleton brings home his bride, who now, for the first time, realizes the fact that she has wedded a man with whom she has no sympathy. The thought drives her so nearly to madness, that she reveals the true state of things to her unhappy husband, who, in a scene strongly resembling one in the “Lady of Lyons,” resolves that in name only shall they be husband and wife; he, however, insisting that Lady Clare shall respect his honour. Act III. passes at the ante- room of the Casino, at Dieppe, where the principal personages of the story meet. Melissa, now Lady Ambermere, not content with having carried off her rival’s fiancé, tries to win Lady Clare’s husband from her, and succeeds in provoking a duel between the two men, which comes off in Act IV., Lady Clare arriving in time to receive the bullet that would have struck her husband. In Act V. it is clear that the heroine has got to love and esteem honest John Middleton; and when Lord Ambermere, whose wife has eloped with his intimate friend, appears, and once more utters his protestations of love, she crushes him with the scorn which the admirable acting of Miss Ada Cavendish made truly grand. The husband overhears the duologue, and expelling with ignominy the contemptible cousin from his house, takes his repentant and now loving wife to his bosom. To tell this in many respects dramatic story, Mr. Buchanan may be congratulated on having secured an exceptionally satisfactory cast for all his female, and more than one of his male characters. As the heroine, Miss Ada Cavendish gave a stage picture of haughty beauty, simulated indifference, and eventually of womanly tenderness, that would be difficult to match; and the loud and frequent expressions of approval she evoked from her audience were indeed well deserved. The Countess of Broadmeads, in the hands of Miss Carlotta Leclercq, was a natural and thoroughly praiseworthy impersonation; Miss Harriett Jay, as the Hon. Cecil Brookfield, had a part which fitted her, so to speak, like a glove, and she played it with a light-heartedness and charm that made it a performance altogether sui generis. To Miss Lydia Cowell, the very best ingénue on the London boards, was allotted the role of Mary, John Middleton’s sister, and rarely has even this charming actress played with more delightful freshness. The repulsive part of Melissa Smale, a sort of female “cynic,” was undertaken by Mrs. Digby Willoughby, who did it full justice, and appeared to far better advantage than in other parts she has essayed. Mr. Philip Beck did all that was to be done with the unsympathetic role of Lord Ambermere; Mr. Alfred Bucklaw—tame at first as John Middleton— improved as the piece progressed; Mr. Horace Wigan was certainly not up to his usual standard of excellence, and “made up” ridiculously as Mr. Gould Smale, an American millionaire; and Mr. Lawrence Gray, a rising young actor, was satisfactory as Major O’Connor, an Irishman, who, mirabile dictu, does not want a duel to come off. Some very effective incidental music has been written for the piece by Mr. Walter Slaughter, the composer of “An Adamless Eden.” The scenery was very good; Mesdames Cavendish, Leclercq, and Willoughby’s dresses superb, and Miss Cowell’s very dainty and charming. Performers and author at the close of the performance received hearty calls from a crowded house. This house was re-opened on Wednesday evening with a new drama (founded on Georges Ohnet’s romance “Le Maitre de Forges”) which Mr. Buchanan calls Lady Clare. The piece was received with attention, hearty applause followed the efforts of the leading actors, and at the close the author was called before the curtain and cheered. It is impossible, however, to endorse the friendly verdict of the first-night audience, on account of the utterly unsympathetic nature of the author’s story and characters. The Lady Clare is thrown over by her cousin, Lord Ambermere (who weds the daughter of an American millionaire), and in a fit of pique accepts the offer of a wealthy manufacturer. He is intended to be a lofty type of honour and integrity, but in action becomes hard and unrelenting, while his wife forfeits all claim to regard by seeking to run away from her home on the very night of her marriage. Subsequently the lord reappears, and after making love to his cousin quarrels with her husband. A duel is the result, and at the moment the signal is given to fire Lady Clare rushes between the combatants, receiving the bullet of Lord Ambermere in her shoulder. In the last of the five acts the lady is again persecuted by her cousin, and her confession that she was wounded in endeavouring to save her husband is overheard by the latter, which leads to a happy conclusion. Miss Ada Cavendish played the heroine with commanding earnestness, dignity, and dramatic expression, and the favour the piece attained was mainly owing to her really fine acting. Mr. Philip Beck was the wicked lord, and Mr. Alfred Bucklaw the husband. A boy’s part was spiritedly played by Miss Harriet Jay; Miss Lydia Cowell was piquant, pretty, and pleasing as the manufacturer’s homely sister; and Mrs. Digby Willoughby played the repulsive American lady with considerable force. In his new five-act drama Lady Clare, just produced at the Globe Theatre, Mr. Robert Buchanan admits his obligation to “a celebrated French romance,” which, although its name is not given, may be pretty safely identified with the “Maitre de Forges.” Lady Clare is the daughter of the Countess of Broadmeads— a lady rich in noble blood, but poor in pocket. A wealthy manufacturer, John Middleton, a self-made man who has risen from the ranks, proposes to Clare, and is rated soundly for his presumption. But Lord Ambermere, Clare’s cousin, and her affianced, in order to extricate himself from some gambling difficulties, has jilted his sweetheart and engaged himself to the vulgar daughter of an impossible American millionaire who is willing to pay handsomely for his daughter to share a coronet. Incensed at her lover’s perfidy, Clare accepts Middleton, and they are married; but when they return, after the ceremony, to spend the honeymoon at Middleton’s house, the bride declares that she will be a wife only in name. After a powerful scene, which reminds one of Pauline and Claude Melnotte in the Lady of Lyons—with the position reversed—a compact is made that, although they continues to live together beneath the same roof, they are henceforth to be nothing to each other. Ambermere, soon tiring of his American wife, begins to flirt with Clare, and follows her about from place to place on the Continent. She repulses his advances, on which he forces a quarrel on Middleton, resting safe in the knowledge of his skill as a duellist to put his rival out of the way. Clare hears of the impending duel, and determines to save her husband, for whose sterling qualities admiration, and next love, have been growing in her heart. She arrives just at the moment of the encounter, and, flinging herself between the combatants, receives the bullet which would have laid Middleton low. Of course Clare does not die, and when she recovers Middleton—who has a faculty for eavesdropping—overhears her giving Ambermere a very salutary lecture, and confessing that it was her newly-awakened love for her husband, and no solicitude for the welfare of the old love, that had led her to interpose between them. There is nothing further to do than for Clare to throw herself into Middleton’s arms, and for Ambermere to take his leave with what grace he may. There is a pervading atmosphere of gloom in the piece; but this is pleasantly relieved by a pair of juvenile lovers, whose billings and cooings are remarkably well presented by Miss Harriett Jay and Miss Lydia Cowell. There are some manifest absurdities in the character of the Hon. Cecil Brookfield, but these are not of Miss Jay’s creation—indeed, her assumption is one of considerable merit; bright, confident, and boyish. Miss Cowell also plays with much simplicity and prettiness. The principal weight of the piece rests, of course, upon the exponent of the name-part; and it can hardly be said that Miss Ada Cavendish is fitted with a character calculated to display her best powers. Mr. Alfred Bucklaw, as the hero, John Middleton, plays with manly reserve and quiet force; but Mr. Philip Beck makes of Lord Ambermere nothing more than the conventional villain of melodrama; while Mr. Horace Wigan’s delineation of the American millionaire is a grotesque caricature. Amongst the remaining characters the only one deserving mention is the Countess of Miss Carlotta Leclercq. Lady Clare met with success, and this, too, at the hands of an audience evidently possessed of a keen sense of the ridiculous. 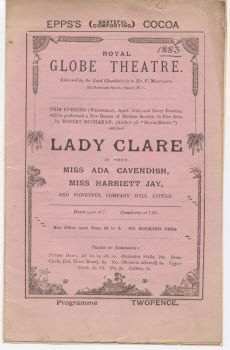 Some of the critics have called Miss Harriet Jay, as she appears in a masculine part in “Lady Clare,” “the nicest boy in all the world.” The phrase has evidently pleased the lady and her friends, for it is now set forth in the advertisements at the Globe Theatre, and a kind of official statement is appended thereto to the effect that Miss Jay has derived her ideas of boy-life from the study of an Eton boy borrowed expressly from his parents for the purpose. I thought the story of Miss Jay and the Eton boy a fiction at first, but I am now in a position to state that it is perfectly authentic. A friend of mine has had it from Mr. Robert Buchanan’s own lips. a celebrated French Romance. By Robert Buchanan. COURT.—Revival of ‘All For Her,’ a Drama in Three Acts. By Palgrave Simpson and Herman C. Merivale. MR. BUCHANAN’S long continued pursuit of dramatic success has brought him within sight of his object. Judged even by the not very difficult standard of modern criticism, ‘Lady Clare’ is not a good drama. It is none the less the work of a man likely to write a good drama. Neat in construction, easy in movement, and free from redundancy, it hits the taste of the public, and proves that its author has ceased to chase such will-of-the-wisps as originality and literary flavour. Some of the characters, the villains especially, are conventional, the workmanship at points is perfunctory, and the demand made upon the credulity of the spectator is strong. Yet in its class ‘Lady Clare’ is clever work. To tell in five acts of one scene each a story which is exciting, fairly sympathetic, and not hopelessly improbable, to supply each separate act with a strong situation, to weave into a plot which seems consistent throughout incidents taken from half-a-dozen different stories, and to enliven the serious interest with comic scenes which are fresh and natural, is no insignificant accomplishment. This Mr. Buchanan has done, and the play he has produced is likely to obtain a long lease of success. Its action is almost uninterrupted, the interest is maintained, and the conclusion leaves the spectator unwearied. To indicate the sources to which Mr. Buchanan may have had recourse or the plays in which a portion of his action is anticipated would be a long task. To name a few only, a well-known novel of M. Georges Ohnet avowedly supplies a portion of the interest; at the outset ‘Lady Clare’ suggests ‘New Men and Old Acres’; its story soon strikes off into the ‘Lady of Lyons’; ‘La Tentation’ of M. Octave Feuillet, and ‘Still Waters Run Deep,’ by Tom Taylor, are in turn recalled; and the concluding scene is that of ‘Impulse.’ The crowning situation, in which a wife, arriving in a wooded glade too late to prevent a duel, interposes between the combatants and receives in her shoulder the bullet intended for her husband, is intrinsically strong. It owed much, however, to the efficient rendering of Miss Ada Cavendish, whose fall was a triumphant piece of stage effect, and who throughout acted with much power and passion. Miss Harriett Jay played with spirit and effect the part of a boy, and Miss Lydia Cowell furnished a pleasing sketch of girlish simplicity. In the masculine portion of the representation the only thing calling for notice was the inconceivably bad make-up of Mr. Horace Wigan. Mr. Buchanan seems a little fogged in regard to social relations. The Countess of Broadmeads must be accepted as a widow, seeing that no husband is heard of, or, under the most momentous circumstances, called into council. Nothing is said about her being a peeress in her own right. Yet while her only daughter is properly styled Lady Clare Brookfield, her only son is the Hon. Cecil Brookfield. If the earl is still alive, in an asylum, or elsewhere out of the way, his son takes the second title; if dead, the son is, of course, Earl of Broadmeads. These are matters of subsidiary importance, but correctness is always to be sought. Mr. Robert Buchanan’s new comedy, entitled Lady Clare, at the GLOBE Theatre, presents a curiously incongruous combination of well-known incidents in popular plays. For this, however, not the author, but the French novelist, M. Ohnet, is mainly responsible, for Lady Clare follows pretty closely the incidents and situations of a novel by this writer, entitled “Le Maître de Forge,” which has enjoyed considerable popularity in France. The dramatist’s theme, as is indicatedby the quotation from the “Idyls of the King” which furnishes the motto of the playbill, is that of a wife who undervalues a good and worthy husband, but lives to acknowledge her mistake with bitter remorse. All ends happily in this instance, but unfortunately the self-willed and capricious heroine secures but little sympathy, her contemptuous treatment of Mr. John MiddIeton, the wealthy manufacturer, whom in a pique she has condescended to marry, being absolutely without excuse or palliative. Miss Ada Cavendish, though she plays the part with some power and fascination, certainly does little to mitigate this defect. Nor does Mr. Bucklaw’s rather stiff and formal portrait of the ill-used husband arouse any great commiseration for his long suffering. This lack of interest in the main course of the story would certainly have been more perilous if it had not been for the efficient aid lent by Miss Harriett Jay’s excellent performance of the part of a lively-spirited Eton boy, who makes love in a boyish fashion to a sister of the slighted husband, a part also very naturally and effectively played by Miss Lydia Cowell.The play is well put upon the stage, and on the whole it was very favourably received. Mr. Robert Buchanan’s drama, entitled “Lady Clare,” reminds one of several pieces that have gone before; but it tells a story in which genuineness gets the advantage over shoddy, and its five acts, in spite of many faults, are interesting. Lady Clare loves her cousin, Lord Ambermere, a dissolute scamp, and rejects, even insults, an honest wooer in the substantial John Middleton. She champions her lordly cousin, and will not believe in his supposed baseness. A visit from the family solicitor, however, opens even her eyes, and after she learns that Lord Ambermere has “thrown her over” in favour of an American heiress, she finds in John Middleton an accommodating instrument by which she saves herself from abject humiliation. John Middleton, who was but just now despised and rejected, appears upon the scene, and is introduced to Lord Ambermere and his Yankee fiancée as the intended husband of Lady Clare. In the next act we find that Lady Clare has married the rich commoner, but as she reaches her future home it is only too evident that she has no love for her husband. John Middleton appreciates his position; he sees that he has been duped, and in a scene which necessarily reminds one of an episode in the “Lady of Lyons,” he assures her that he will not take that position which is now his by right; in fact, he tells her that they will be only husband and wife in name, that to prevent a public scandal they will live under the same roof, but separately. In the next act, we find them at the Casino, Dieppe, where are also Lord Ambermere and the American heiress, now married. Ambermere is tired of his new love, and wishes to “hark back” to the old. He finds Clare, alone, and once more plays the part of the lover. In the midst of his frenzied protestations, John Middleton appears, and in a subsequent altercation it is arranged that the rivals shall fight. The consequences of Lady Clare’s indifference to her husband now begins to dawn upon her; she cannot help seeing that she has brought all this trouble upon a man who has treated her with every consideration. She learns that the two men have agreed to fight, and she determines to prevent the collision if possible, and in the quiet glen, when the two combatants have walked the stipulated number of paces, and Ambermere has turned and fired at his adversary, it is found that Clare has rushed between the two men, and is wounded by the lover of her youth. In the last act, we find that Clare is recovering rapidly. Her husband seems to be under the impression that he interference at the moment of the duel was due to a desire to save Ambermere, but of this idea his mind is disabused by listening to an interview which takes place between his wife and his rival, who has once more obtruded his society upon her. He hears her denounce the man who has ruined their happiness, and furthermore learns from her lips that it was her husband who alone commanded her sympathy when she placed herself in such jeopardy. These and other protestations are sufficient to convince John Middleton that his wife has learned at last to love him, and thus all ends happily. This piece is fairly well played. Miss Ada Cavendish as Lady Clare is seen to best advantage in those passages in which pathos plays no part. Miss Cavendish can be powerful and cynical, but genuine tenderness scarcely seems within her register. Mrs. Digby Willoughby, as the American adventuress, is asked to make herself thoroughly objectionable, and she succeeds in this most completely. Miss Carlotta Leclercq, as the mother of Lady Clare, does all that can be done with the material; Miss Harriet Jay, in a boy’s part, shows to greater advantage than we have ever before seen her; while Miss Lydia Cowell displays that freshness and intellect which have always shone through her acting. Of the gentlemen who share in the performance we cannot speak so highly. The important part of John Middleton is entrusted to Mr. Bucklaw, a young actor, who seems new to us. This gentleman rejoices in a good presence and an excellent voice, while in his favour it may be said that his method is not blurred by meretriciousness or by attempts to accomplish feats out of his reach. We think he could do much more than he does if he would but try. If we mistake not, however, a strong actor in this part would have done that for Mr. Buchanan’s piece, which is not exactly forthcoming now. Mr. Beck, in the unthankful rôle of Lord Ambermere, acts fairly, and Mr. Horace Wigan, as a wealthy American, makes up as a conventional Yankee showman. Most of the scenery employed in this piece has been seen before. As a general rule it must be held extremely unfair to disparage a new play simply because its subject has already been treated on the stage. There is, we know, nothing new under the sun, so we must not look for much that is new before the footlights. Nevertheless, there is much substantial justice in the complaint made against Mr. Buchanan’s Globe drama Lady Clare, that it suggests in almost all its scenes and characters some piece already familiar. A list of the prototypes, we do not say the sources, discovered for Mr. Buchanan’s latest stage-work by its critics seems worth giving as a curiosity. So far as we have observed, it includes Impulse, The Lady of Lyons, The Old Love and the New, Led Astray, and New Men and Old Acres. As a matter of fact, however, Lady Clare is, we believe, an adaptation, more or less free, of Ohnet’s novel “Le Maître de Forge.” Its hero, at any rate, is a wealthy and worthy iron-master, who marries above him, in the sense that he takes to wife a haughty young lady of title who despises trade, and accepts him only in a moment of pique at being jilted by her cousin, Lord Ambermere. Of course the marriage is an unhappy one, and Lady Clare lives in Mr. Middleton’s house on much the same terms as those arranged between Pauline and Claude Melnotte, or the hero and heroine of Impulse. Without at all intending to do so, Lord Ambermere comes to the rescue, and is ultimately the means of bringing husband and wife to a happier understanding. He is an extremely wicked young lord, and the American heiress whom he has married for her money and who hates his former love is at least as bad as he is. From a horrible motive this lady throws her husband in the way of Lady Clare, and contrives to arouse the jealousy of Mr. Middleton, who is provoked, at the Casino Dieppe, to a duel with the man he believes his rival. The duel is interrupted by Lady Clare, who, throwing herself between the combatants, receives a pistol shot. This climax is reached at the end of the fourth act, and although by no means novel, proves highly effective. If indeed the presentation of the male characters was in the hands as strong as those of Miss Ada Cavendish, who plays the heroine, Lady Clare would appear to be a domestic melodrama of considerable vigour. But Mr. Bucklaw, as Middleton, is at best respectable, and seems to lack experience for the making of such points as Mr. Buchanan has strung together; whilst the Lord Ambermere of Mr. Philip Beck is foolishly affected, and suggests an amateurish imitation of Mr. Willard. In the last act there is nothing to do but reconcile husband and wife, a consummation awkwardly brought about by making Middleton overhear Lady Clare repulse the persistent attentions of Lord Ambermere, whom he very properly threatens to kick out of his house. It appears, too, that the interposition of Lady Clare between the duellists was really on behalf, not of her lover, but of her husband; so after quoting Guinevere’s penitent exclamation, “We needs must love the highest,” &c., she makes up her mind to be a good wife to the iron-master who, although not exactly “the highest,” is, at least, a very worthy fellow, except for his habit of eavesdropping. Besides Miss Ada Cavendish’s very spirited and striking performance in the name-part, the impersonations of Miss Harriett Jay and Miss Lydia Cowell in minor parts deserve much praise. The former executes happily a difficult task in her sketch of a light-hearted schoolboy, always anxious to be present at a “jolly row,” except when he is engaged in a boyish flirtation with little Mary Middleton, a young girl very prettily embodied by Miss Cowell. Miss Carlotta Leclercq is safe but conventional as the heroine’s wordly-minded mother; Mr. Horace Wigan as an American “silver king” is also conventional though anything but safe, as his absurd caricature is in danger of provoking very untimely ridicule. Yankee millionaires are sometimes, we know, odd-looking persons; but there is a limit to their peculiarities of appearance and manner. Lady Clare, which seems to possess the elements of very possible popularity, is mounted in a way which does credit to the new management here. Globe Theatre on Wednesday, April 11, 1883. The Countess of Broadmeads MISS CARLOTTA LECLERCQ. Lady Clare Brookfield ... MISS ADA CAVENDISH. Hon. Cecil Brookfield ... MISS HARRIET JAY. Lord Ambermere ... MR. PHILIP BECK. John Middleton ... MR. ALFRED BUCKLAW. Mr. Gould Smale ... MR. HORACE WIGAN. Count Legrange ... MR. E. HAMILTON BELL. Major O'Connor ... MR. LAWRENCE GREY. Woosnam ... MR. L. CANNAM. Mrs. Forster ... MISS CLIFTON DELMAR. Grimes ... MR. H. JONES. “LADY CLARE” contains the germs of a charming and dramatic story, but Mr. Robert Buchanan has displayed very little constructive power in his latest work, and he has contrived to spoil what might, under abler hands, have been made into a good drama. The play does not even possess that literary finish which might have been expected from its author. The dialogue is neither forcible nor polished. Each act recalls scenes from other plays, and it must be admitted that the drama is a crude, unsatisfactory work. The story is this; The first of the five acts into which the play is divided takes place at the home of Lady Clare Brookfield. Lady Clare is in love with Lord Ambermere, and her affection is returned. She is also loved by a wealthy manufacturer, John Middleton, who asks her to be his wife. She refuses his suit, but on hearing that Lord Ambermere is ruined, and that, in order to retrieve his fortunes, he is about to marry a rich American girl, and also to recoup her own shattered estate, Lady Clare agrees to marry Mr. Middleton. In the second act we hear that the heroine is married, but still, not loving her husband, she resolves to fly from him. Middleton will not allow her to thus desert him, and he and his wife determine to live together husband and wife in name only. The third act takes place at Dieppe. Lord Ambermere has followed Lady Clare and her husband, and, through an opportunity provided by his wife, who is jealous of his old love, he makes an avowal of his passion for his proud cousin. He is interrupted by the arrival of Middleton, and the two men quarrel, with the result of a duel being arranged. The fourth act shows in its first scene how Lady Clare discovers that her husband is going to fight Lord Ambermere. The second scene of this act takes place in a forest glade. The two men arrive to fight, and just as they fire—the duel being with pistols—Lady Clare rushes on and falls apparently lifeless. The last act depicts the recovery of Lady Clare, who has only been shot in the shoulder by the bullet intended for her husband. At last she has learnt to love her husband, and to recognize the value of his noble nature. She is debating in her mind as to the expediency of telling him that she loves him, when the intrepid, shameless Lord Ambermere enters and again avows his passion. He is vain enough to think that in her endeavour to stop the duel Lady Clare had been concerned in his safety instead of that of her husband. But for once he is mistaken, and the lady turns upon him and tells him that she loves her husband. Middleton has heard her repulse the scoundrel, and he orders Lord Ambermere off the premises, husband and wife being at last united. The burden of the acting falls upon Miss Ada Cavendish, who plays with much art and true passion, although the character of Lady Clare is unworthy of the actress. Mr. Alfred Bucklaw is too inexperienced and not sufficiently interesting for the part of Middleton, and Mr. Philip Beck is somewhat stagey as Lord Ambermere. Miss Harriett Jay gives a fresh, bright, and unconventional rendering of a boy, and Miss Lydia Cowell is charming in a small role. Mr. Horace Wigan appears as a wealthy American, and distinguishes himself by a hideous and uncharacteristic disguise. The entire “new drama” is an exact paraphrase of a story by Georges Ohnet, called “Le Maitre de Forges,” scene for scene and situation for situation. “LADY CLARE” AT THE GLOBE THEATRE. THE chief incident in our picture from Mr. Robert Buchanan’s piece at the Globe Theatre is the episode in the first act, by the lake at Broadmeads. The characters are the Hon. Cecil Brookfield (Miss H. Jay), who is fishing, Lady Clare (Miss Cavendish), and the Countess (Miss Carlotta Leclercq). At the foot of the page is, perhaps, the most striking incident in the drama—when, immediately after the wedding, Lady Clare repents her marriage with the wealthy commoner, John Middleton (Mr. Bucklaw), and is restrained by her husband on the point of flight. At the top are the Hon. Cecil Brookfield and Mary Middleton (Miss Lydia Cowell) at the Casino Dieppe. There are also portraits of Miss Ada Cavendish in the title character, and Mrs. Digby Willoughby as Melissa Small.
. . . Mr Harris has purchased the provincial rights of Mr Robert Buchanan’s play, “Lady Clare,” and Mr Buchanan’s new drama will probably be the first autumn novelty at Drury Lane. “LADY CLARE.”—The modern and popular custom of transplanting London plays when a suitable occasion presents itself is to be illustrated in the case of Mr. Robert Buchanan’s “Lady Clare,” now being performed at the Globe Theatre. This drama will be produced at the Theatre Royal, Brighton, on Thursday next, and at the Crystal Palace on the following Saturday. Thus a wider significance will be given to the fine, nervous acting of Miss Ada Cavendish, whose performance as the heroine of Mr. Buchanan’s play has contributed not a little to its success. It is said that Mr. Augustus Harris has some intention of playing himself the part of the hero of Mr. Robert Buchanan’s “Lady Clare,” over which piece Mr. Harris has secured what are called the country rights. George’s o’Hnet’s successful play, Serge Panine, was performed by the Paris Gymnase Company at the Gaiety Theatre to-night, but strangely enough attracted but a very small audience. Madame Pasca played finely, and was well supported. The story of Serge Panine has already been partly used on the English stage, being the foundation of Mr. Robert Buchanan’s Lady Clare, at the Globe. Our theatres are now running out the season with what plays they have in their bills. One or two are making changes, but they have no novelties to offer. Mr Wilkie Collins’ play, “Rank and Riches,” has proved a dismal failure, and the manager, in order to show his courage in adversity, has borrowed “Pluck” from the repertoire of Drury Lane. Mr Robert Buchanan’s drama, “Lady Clare,” has come to a termination in the midst of a success quite unexampled in the dramatic experiences of the Scotch poet. The withdrawal of a play which is so successful is not quite intelligible. Mr J. L. Toole has let his theatre to Mr Tom Robertson for the production of the Robertson dramas. Many will greatly regret this step, as he is doing the best business which the little house in King William Street has experienced for some time. On dit, that several of our fashionable operetta theatres are doing badly, but are bravely concealing their ill-luck. The French plays at the Gaiety are not drawing in a manner to keep up the traditions of this venture. “LADY CLARE” AT THE THEATRE ROYAL. Mr. Robert Buchanan is not one of fortune’s favourites. Despite the fact that he is an admirable writer of fiction, and has turned out some of the best novels of the day, his fate on the stage is a history of accumulated disaster. Even Mr. Buchanan himself would experience a difficulty in recalling one of his plays that has been an unequivocal success. If there is, however, one calculated to retrieve his lost laurels, it is his new five-act drama of modern society, entitled “Lady Clare.” This drama, after having been rehearsed in London under the personal superintendence of Mr. Augustus Harris, has been sent on tour through the provinces. Mounted, dressed, and acted with the perfection that the piece was at the Theatre Royal on Monday evening, its tour should be attended with supreme success. At the opening Lady Clare Brookfield, daughter of the Countess of Broadmeads, is found to be engaged to her cousin, Lord Ambermere. His Lordship, a callous roué and libertine, finding himself pecuniarily embarrassed, throws over his pretty but impecunious cousin in favour of Melissa Smale, the daughter of an American millionaire, named Mr. Gould Smale. Piqued to the verge of madness by the heartless slight of the man she had really loved, under the impression of reciprocated affection, Lady Clare hastily accepts John Middleton, a wealthy manufacturer, whom she had previously rejected. As Lord Ambermere merely required money, and Melissa Smale a title, the pleasantest possible use is made of this marriage de convenance. On the other hand, John Middleton is devotedly attached to Lady Clare, who still has the old love strong within her. So much so, that on being taken to her husband’s home she, in a frenzy of repentance for the jealous hastiness with which she has enslaved herself, seeks to escape from her new home on her nuptial night. She is, however, prevented by her husband. Confession is made, then mutual recriminations ensue, with the result that both prepare themselves to live a life-long lie—man and wife to the world apparently really and actually, but to themselves only the mockery of a specious name. The following acts develop a gradual change of feeling on the part of Lady Clare, her infatuation for her cousin yielding to a strong admiring love for the noble qualities of her devoted husband. A duel, which the villainous lord forces upon Middleton, vouchsafes the opportunity for her to unexpectedly throw herself between the combatants, with the result that the ball that would indubitably have caused the death wound of her husband is received by her in the shoulder. Although her husband is still under the impression that her object was to save the life of her old lover, everything is explained in the end, and mutual happiness ensues. Lord Ambermere is deserted by his pretty chit of a wife, and finds humiliation on all hands. A brisk under plot of love between a gay-spirited young son of the Countess and a bright-eyed sister of John Middleton adds an additional sparkle of romance to one of the best plays of its kind that has been put upon the stage. Miss Kate Pattison, whose ability as a strong emotional actress is too well known to need any endorsement in these columns, played Lady Clare with charming grace. She was supported by Mr. W. S. Sutherland, who, as John Middleton, showed histrionic ability of a high order of merit. The part of Lord Ambermere was pourtrayed with a clever assumption of refined villainy by Mr. Augustus Cook; Miss Lizzie Claremont was the Countess of Broadmeads; Miss Grafton made a most bewitching Melissa Smale, with the prettiest of nasal twangs beloved of the Yankee; and Mr. Harry Parker was her very American father. The part of the Hon. Cecil Brookfield was played with a very judicious subjugation of blithesomeness by Miss Daisy England, who had a most fascinating little fiancee in fresh, unsophisticated Mary Middleton, who was depicted with charming naïveté and natural vivacity by Miss Barker, a young but highly promising actress. The subordinate parts were creditably filled. Most sumptuous dresses were worn in the piece, which was also mounted with scenes painted by Mr. Henry Emden, the like of which have not probably been seen on the local stage since its institution. The piece, in the production of which the master hand of the redoubtable Augustus Harris is so clearly traceable, is a sight to be seen by all local playgoers. THEATRE ROYAL.—Lessee and Manager, Mr J. W. Boughton.—Mr Augustus Harris’s Lady Clare company have been engaged for six nights, and the appearance of the house on Monday promised well for the week. The company is extremely well selected. Miss Kate Pattison does well as Lady Clare; Miss Daisy England also enacts the Hon. Cecil Brookfield with taste. Mr A. Cook as the villain Ambermere, is well up to his work; and Mr W. S. Sutherland’s conception of the part of John Middleton is a fine study. The scenery is of the most artistic description; in fact, Lady Clare is about the best thing we have had here for a very long time. MISS DE GREY AT THE NEW THEATRE. Last night Miss de Grey, the well-known tragedienne, and a dramatic company of her own special selection, and under her own immediate direction, commenced a six nights’ engagement at this house, appearing in a five act play, which had never been previously acted in Bristol, called “Lady Clare.” It is from the pen of Mr. Robert Buchanan, and was produced originally at the Globe Theatre, London, with Miss Ada Cavendish in the title rôle. The piece tells a story of an ill-assorted marriage, and its plot may be thus briefly described:—Lady Clare, the heroine, is the daughter of the Countess of Broadmeads, a lady rich in patrician blood, but for her rank and station very poor in purse. One Lord Ambermere, a cousin of the young Lady, has been paying his addresses to her, but having become financially embarrassed by some gambling transactions he jilts his aristocratic cousin and accepts as his bride Melissa Smale, the daughter of an American millionaire, who having a plethora of gold comes down handsomely in order to purchase a coronet for his daughter. At the commencement of the action John Middleton, whom we suppose we must regard as the hero of the story, who is a self-made man and has built up a large fortune as a manufacturer, is enamoured of the Lady Clare and proposes for her hand. His presumption is at first resented, but finding that she has been deceived by Lord Ambermere, and incensed at his perfidy, the titled young lady accepts the advances of Middleton and becomes his wife. After the ceremony the newly-married pair return to Middleton’s home to pass the honeymoon. It is not, however, all sweets, for there occurs a scene which we remember was disapprovingly animadverted upon by the Metropolitan press at the time of the first performance, and which is no doubt palpably a paraphrase of the famous scene at the cottage of Claude Melnotte’s mother in Lord Lytton’s “Lady of Lyons.” The lady, overborne by her pride of ancestry, gives expression to her previously pent up feelings, and declares that she will be a bride only in name. As the result of this disclosure of Lady Clare’s real sentiment towards her newly-acquired bridegroom and the scene which ensues, a compact is made by which it is agreed that although they shall live together under the same roof, they beyond that shall be henceforth as nothing to each other. This scene is a powerful one, but as good an effect might, we think, have been achieved without trenching so closely upon Lord Lytton’s lines. Lord Ambermere, soon tiring of his American wife, begins to ply his arts against his former lover, and follows her about from place to place in the hope of inspiring her with a passion in his favour. Finding that she repels his advances, he, relying on his great skill with the pistol, fastens a duel on Middleton in the confidence that it will enable him to get his rival out of the way. As duels are illegal in England it is agreed to bring off the contest there in France, Lady Clare becomes informed, however, of the intention, and having been brought by her husband’s sterling qualities to form in her breast feelings in regard to him more akin to the love she owes him she determines that at all hazards she will save him. She arrives on the scene just at the moment that Lord Ambermere fires, and, rushing wildly between the combatants, receives the bullet which was intended for her husband. The wound, of course, does not prove fatal, and Middleton becoming assured by a conversation which he overhears that the solicitude which so nearly cost Lady Clare her life was for him and not for his rival, a happy reconciliation is brought about, and Lord Ambermere, by taking his leave of the Oaklands, escaped from the danger of being kicked out. In weaving the story we have thus briefly sketched into dramatic shape, Mr. Buchanan has displayed a fair amount of constructive skill, and his more striking situations, if not altogether new, are generally effective. Any weakness in the play lies in its being a little over sombre in its tone. If it were not in the relief afforded by the scenes between the young Honourable Cecil Brookfield and his youthful inamorata, Mary Middleton, this would be more notably apparent. The playwright has evidently felt the want of the lighter element, and in his anxiety to supply it has sketched the character of his boy extravagantly. In the effort to make him funny he has trenched on the lines of absurdity, and has too, in some degree, detracted from the simplicity which we are wont to associate with the boyish character. The play was well acted, and if it is true, as we hear, that this company acted together for the first time, surprisingly well. Miss de Grey displayed great histrionic power in her interpretation of the character of the heroine. Imperious pride is its dominant emotion., but underneath that there lies a keen sense of honour and some amount of tenderness. Miss de Grey brought out all the varying phases and rendered the different scenes with an impressiveness which well merited the enthusiasm she evoked. A more repulsively-drawn character than that of Melissa Smale could hardly be found in the entire range of the drama. She is selfish, hypocritical, and altogether unwomanly. Mrs. Digby Willoughby, its original exponent, appeared in it, and rendered it with a skill which could hardly be too highly lauded. Mr. Felix Pitt presented a manly and dignified portrait of the high-souled husband, John Middleton, who is not, it may be well to state, a self-made man of the ordinary stage type, but is in reality “one of nature’s noblemen.” Mr. Fred Terry was also excellent as Lord Ambermere, and Mr. W. Farren, jun., infused as much character as it was capable of receiving into the part of the Yankee millionaire, Gould Smale. The parts of Cecil and Mary were also made the most of, and the characters generally were very creditably filled, as also were the smaller parts, notably that (by Mr. John Forsyth) of Grimes, a workman. The scenery, as is always the case at this house, was excellent, and the costumes were superlatively good. Sir,—I have lately enjoyed the privilege of witnessing the production of this drama at Torquay by Miss De Grey’s most artistic company. The performance was above criticism, and being, like Iago, “nothing if not critical,” I was perforce driven from the players to the play. There, Sir, I found what seems to me to be a somewhat curious state of affairs. The husband of the Countess is spoken of in the past tense, and is, therefore, presumably dead. The only children of the Countess, or her deceased husband, who appear are Clare and Cecil, and as the latter is addressed by Mr Smale as “one of our hereditary legislators” it seems to follow that he is his late father’s heir. Yet, Sir, this “hereditary legislator” is introduced to us as “the Honourable Cecil Brookfield.” The House of Lords has been long threatened with reform, but I was not aware that when a peer died his title went to one person and his hereditary legislative functions to another. Can this be so, or have I caught Mr Buchanan tripping? Lincoln’s Inn, September 24th, 1883. BRISTOL—NEW ROYAL (Managers, Messrs. G. and J. M. Chute).—The first provincial representation of Mr. Robert Buchanan’s Lady Clare took place at this theatre on Monday. The treatment the piece received from Miss de Grey’s very efficient Co. was extremely good. In Lady Clare Miss de Grey has a character just suited to her peculiar and pleasing style. Occasionally her acting was really fine, but it is in the quieter portions that Miss de Grey is most effective. Another point for congratulation is having one so well suited to John Middleton as is Mr. Felix Pitt; throughout, his acting was veritably a lesson. Mr. Fred Terry, as Lord Ambermere, was telling, and so was Mr. E. Underhill as Count Legrange; Mr. G. W. Farren, jun., was much appreciated as the bragging Yankee, and other of the male parts were competently filled by Messrs. F. Mouillot, J. W. Piggott, F. Webster, J. Forsyth, and Lawrence. Mrs. Digby Willoughby, as the designing Amalia, evidently carried out the author’s ideas, and excited the indignation of the denizens of the theatrical Olympia; Mrs. E. Clifton was sufficiently dignified as the Countess; Miss Deby was scarcely at home as Cecil; and Miss A. Calvert, as Mary, was lively and interesting; Miss B. Huntley, as the Housekeeper, was prominent through being so unassuming. Altogether the play was a great success. THE “LADY CLARE” COMPANY IN HASTINGS.—Monday last saw the advent of Mr. Augustus Harris’s Lady Clare company from the Drury Lane Theatre, London, to these towns, and on that evening the first performance of Mr. Robert Buchanan’s masterpiece was given in the Gaiety Theatre in Queen’s-road. The nightly production of this drama has been most successful, and during the week the chief artistes seem to have grown in favour at every appearance. The caste was in all respects a very powerful one, and the interest of the piece from the rise of the curtain on the Broadmeads Garden to the final reconciliation at Oaklands was never once allowed to flag. The new scenery by Mr. Henry Emden and the general appointments of the piece were altogether admirable, and it may be said, without much fear of contradiction, that the engagement carried out this week, and which terminates tonight (Saturday), has been in many respects the best that has ever graced a local stage. The characters are drawn from various nationalities, English, French, Irish, and American being all represented. The most praiseworthy character was certainly the John Middleton of Mr. N. R. Sutherland, which was almost perfect. The Lord Ambermere, too, of Mr. Augustus Cook was a capital assumption of the dissolute nobleman, and the other roles by Mr. Harry Parker, Mr. Edmund Lyons, and Mr. Burton Rolins were all well played. Of the ladies, the first place must be given to Miss Kate Patison, who, as the heroine (Lady Clare), acted with conspicuous talent and success. Miss Lizzie Claremont as the Countess, and Miss Carmen Barker as Mary Middleton were also noticeably good. In short, we can only repeat that the engagement of this week has been a most successful one. Lady Clare was revived on Monday evening before an audience of such vast proportions as to suggest the likelihood of an excellent fortnight’s business. As our readers are probably aware, Mr. Robert Buchanan’s drama was originally produced at the Globe Theatre on April 11th of the present year. The story founded on “Le Maître de Forges” possesses many characteristics not foreign to other tales. While the story is an effective one, the drama built upon it is at times made weak by faulty construction; yet, taken all in all, there is a genuine interest deducible from the play which careless adaptation or preachy dialogue can only obscure at intervals. Mr. Robert Buchanan, the author, who was present on Monday night, must have been greatly pleased with the reception given by an East-end audience—a reception, however, which was to a great extent evoked by excellent acting and superbly-dressed scenes. Foremost in the capable cast was Miss Kate Pattison, whose rendition of Clare was marked both by refinement and passionate intensity; a more ladylike impersonation we have seldom witnessed. Her antithesis Melissa Smale was made antithetical by Miss May Howard; and emphatic make-up, an extravagant improver, and an evidently affected assumption of Americanism, made the contrast between the ladies painfully glaring. Melissa may have been vulgar, but if we mistake not, she has had the benefits of a decent education. Miss Lizzie Claremont brought experience to bear on her dignified portrayal of the Countess of Broadmeads, and Miss Daisy England, as the “hereditary legislator” Cecil, played with both finish and go. Miss Carmen Barker made a pleasant and lovable little Mary, and Miss Jeannette Thompson did what little she had to do as Mrs. Foster fairly well. Mr. W. R. Sutherland’s John Middleton was both powerful and impressive, and Mr. Augustus Cook played Lord Ambermere with a quiet dash of expressive villainy which suited the part well. Mr. Harry Parker, always efficient in whatever he takes in hand, was sufficiently Yankeeish as Smale, and Mr. Edmund Lyons was a useful Legrange. The interesting series of revivals of West-end drama is still continued at this house, and, if we may judge by the crowds assembled on Monday evening last at the production of Mr Robert Buchanan’s Lady Clare, Mr Cohen is pursuing an eminently successful policy. Is it that a revolution in taste has come to our East-end playgoers, or are proprietors beginning to find that the old stock drama of the “penny plain and tuppence coloured” type does not pay? Can caterers, hitherto accepting as an axiom, preaching as an exhortation, inculcating as a gospel, that blood and thunder is the only food that “goes down” with the “mob” have at last discovered that, with the advance of education, theatrical taste has improved? It is not well to be too sanguine; but, if we satirise the “palmy days” of the past, there is such brightness in the dramatic horizon as to lead us to hope that the true “palmy days” are soon to come, even if they have not already arrived. At any rate, it says much for the position the stage now occupies that, through the enlightened policy animating the government the historic plays of Shakespeare form part of the study of the upper standards of our elementary schools. To what searching and intelligent criticism will the Shakespearian actor of a decade hence have to submit! It will indeed be incumbent on him to “speak the play trippingly on the tongue.” Whatever time may bring forth we feel confident that a new era must be dawning upon us when we know that such dramas as Lady Clare are not only received with general acceptance in theatres essentially depending upon the residuum for patronage, but are successful in a degree hardly dreamt of by the theatrical caterer of even ten years ago. Loveless marriages provide novelists and playwrights with a fruitful field in which to search for plot and incident. In this respect, therefore, Mr Buchanan’s drama is not strikingly original, and it even contains scenes reminding us of other pieces. Neither is it a production in which strong situations abound, but the subject has been treated in a scholarly manner, the story never loses its hold upon the attention, and so bright and charming a bit of light comedy as the underplot can never fail to make the piece popular wherever produced. If an audience cannot feel an intense sympathy for Lady Clare’s awakening to the nightmare of a guilty passion; if their hearts are not wrung by her yearnings after the love of a noble husband, they never tire of hearing young Cecil Brookfield declare what an awfully nice girl Mary Middleton is. The drama has been produced under the direction of Mr Augustus Harris, with new scenery by Mr Henry Emden, and carefulness and excellence marked the whole stage arrangements. Nothing prettier could be imagined as a stage picture than the water scene in the grounds of the Countess of Broadmeads. The cast possesses a high average of excellence. In Miss Kate Pattison we have an actress who is rapidly working her way to the front. The part of Lady Clare is not overloaded with opportunities; but the grief of the haughty, high-spirited girl when she learns her lover’s faithlessness and the scorn with which the wife bids him leave her in the last act found admirable expression, and Miss Pattison is to be complimented on a really artistic performance. Mr W. R. Sutherland plays admirably as John Middleton. Nothing could be better than the manly and decided tone in which this manufacturer, the puppet of pique and married for his money, brings his aristocratic wife to her senses, and the grief to which he gives way on fully realising what an arid desert life to him will be was finely expressed. Miss L. Claremont, leaving the delineation of strong character parts, acted with considerable refinement as the Countess of Broadmeads. Miss Daisy England succeeded in making the Hon. Cecil Brookfield what he should be—a light-hearted English boy, with plenty of fun and full of pluck. It was always refreshing to hear Miss England’s gay and spontaneous laugh, and altogether the young scion of the house of Broadmeads could scarcely find a better representative. The lovable Mary Middleton, who “will tease a fellow,” as Cecil puts it, was impersonated by Miss Carmen Barker, who never forgot that the part had a shade of pathos in it, and yet always imbued her acting with the requisite spirit. Melissa Smale, a by no means favourable specimen of the land of the almighty dollar, found a majestic representative in Miss May Howard. Lady Ambermere, we think, would hardly present such an appearance as Miss Howard assumed in the casino scene. With the exception of this bad make-up the actress succeeded in imparting a strong individuality to the American girl. Mr Harry Parker gave a rational portrait of Gould Smale, and was well made up; Mr Augustus Cook made a sufficiently villainous Lord Ambermere, and acquitted himself well in the challenge scene; while Mr E. Lyons demonstrated what may be done with such a small rôle as Count Lagrange; Mr Bruton Robins doubled the parts of Major O’Connor and Grimes. In the latter character he shouted a deal too much, and there was nothing particularly worthy of mention in his delineation of the old Irish officer. Mr Pemberton and Miss Janet Thompson did creditably as Woosnam and Mrs Foster. It is to be regretted that Miss Kate Pattison and Mr W. R. Sutherland made such a mistake as to appear hand-in-hand behind the curtain in answer to applause, when a minute before the latter as John Middleton had determined on a separate life. Such a Proceeding as this is a grave blunder, and spoils the illusion. Again the tableau, when the curtain was lifted after the duel scene, gave an air of improbability to the long illness spoken of in the last act, as Lady Clare was discovered standing up, and this, with a dangerous bullet wound in the shoulder, was a palpable absurdity. The successful farce The Opera Cloak, by Messrs Powles and Augustus Harris, preceded the principal piece. Mr Harry Parker invested the part of Mr Adolphus Hopley Malt with all the drollery required; Messrs Augustus Cook and Edmund Lyons were highly amusing as Colonel Fitzpatrick O’Brien and Mr Distin Kettle respectively; while the lady characters found excellent representatives in Misses Daisy England, Lizzie Claremont, Jeanette Thompson, and Carmen Barker. It will require a longer term than a fortnight to exhaust the attractiveness of the present programme at this house.